IT Contractor? Maximise Your Income & We Do Your Admin! Whether going Limited is the right option for you? How to set up a limited company and start contracting through it? What IR35 is and whether it affects you? How to pay yourself through a Limited Company? What if “everything was done for you”, so you could focus on your IT contracting role without having to worry about what admin needs to be taken care of? You’ll be “safe & compliant” - we ensure you remain on the right side of the tax man. You want ongoing guidance / support from specialist qualified contractor accountants throughout your career. How does the “everything done for you” service work? We’ll get your limited company set up or transferred from your existing accountant quickly, without you having to do anything. View a complete list of everything that is included on our 'What’s Included?' page. I would recommend Freestyle to any professional who is looking to setup their own Limited Company, they walked me through the whole process of setting up my company. They offer an all-in-one service with no stone left unturned, which allows me to concentrate on my actual work. In my eyes this is priceless. I think the Freestyle accountancy service is excellent and takes a lot of the paperwork and worries away from me as a contractor. The staff are kind and intelligent and put a lot of effort and hard work into helping their clients and making running a Ltd company easier. The people at Freestyle were a great help...overseeing my affairs and ensuring that I did not fall foul of the numerous pitfalls that ensnare the unwary contractor. Friendly and knowledgeable, nothing is too much trouble for these people. 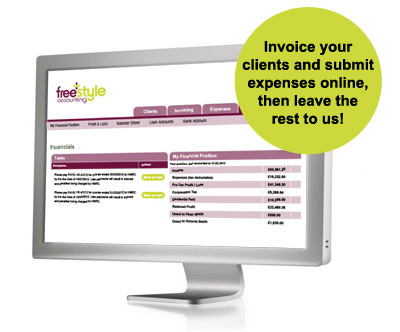 I spend 5 minutes each Friday evening completing my invoicing and entering my expenses on the online portal. A further 5 minutes at the end of the month allows me to draw my salary, expenses and issue dividends. It’s simple! Read more comments from our clients in the testimonials area. If you’re looking for an accountancy firm that’s confident in the service it provides, then Freestyle is for you. We back up our service with the following unique guarantees (including our 30 day money back guarantee) to ensure our customers remain 100% satisfied. If you join Freestyle Contractor Accountants and you’re not completely satisfied with our "everything done for you" service within the first 30 days, then let us know and we will refund your fee*. We’re chartered certified accountants (regulated by the ACCA) and accredited by the Independent Professionals and the Self Employed (IPSE) Association so you can rest assured that we’ll keep you safe and out of trouble. However, if you do ever receive a penalty from HMRC or Companies House, and it’s our fault, we’ll pay it; that’s how confident we are in our service! If you get into financial difficulty we’ll warn you straight away, so you don’t get to the end of the financial year and you’re unable to pay your tax. We advise you how much you need to hold back for all tax liabilities. Don’t be one of those contractors trying to remortgage their home to pay their tax! Finding out that you could retain more of your contract income tax efficiently just by going Limited!